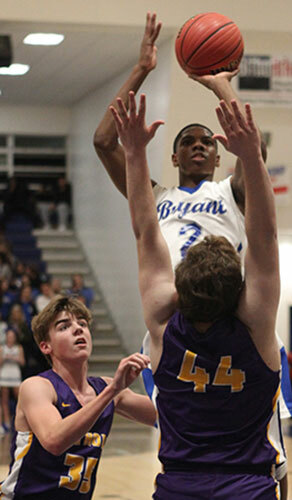 At halftime of their 7A-Central Conference game against the Little Rock Catholic Rockets, the Bryant Hornets had forced just seven turnovers and connected on just 3 of 12 shots from 3-point range, were 1 of 3 at the free-throw line, 6 of 17 from the field and yet, they led 16-13. 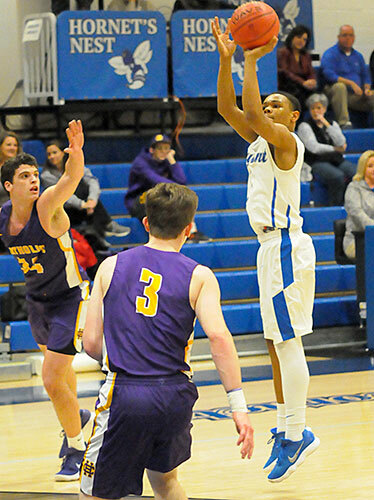 The patient Rockets, who came into the game off a 43-32 win at Cabot (which was 12-2 overall coming in), had the tempo in their favor but they weren’t faring much better on offense going 1 of 7 from 3-point range and 2 of 5 at the free-throw line. The tempo changed in the second half as the Hornets forced the Rockets into turnovers on their first five possessions. Bryant took advantage with an 8-0 run to build the margin to double digits. The Hornets wound up scoring 21 points in the third quarter and ran off and left the Rockets behind in a 50-27 victory. Khalen Robinson hit four 3’s in the game and led the Hornets with 18 points. 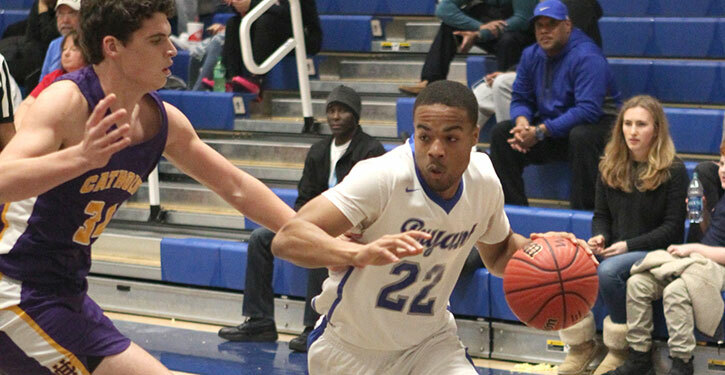 Deron Canada, struggling from 3-point range, hit a big one in the third but also attacked the basket for 15 points. Camren Hunter added 9 on a trio of 3’s. 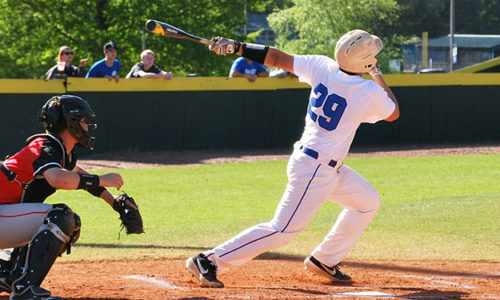 Sam Chumley added 6 but he and Rodney Lambert played key roles in the Bryant defensive effort. Catholic committed 13 turnovers in the second half, making it 20 for the game. Did he and assistant coach Dominic Lincoln make changes or adjustments at halftime, whether X’s and O’s or approach? “Not much,” Abrahamson said. “There were some minor things. We’re running this action where Cam has to dribble to the side. We just said, ‘Hey, dribble a little harder here, be more aggressive here.’ Just things like that. “But the guys really did a good job of sharing the ball, moving the ball,” he related. “That’s just something that we always work on and we always preach and they buy into that. We just believe in our guys. We believe in what we do. That’s what’s got to get us there. He was pleased with the defense too, though Catholic past player Phillips Allison scored 10 of his team-high 12 points in the half. No one else finished with more than 4. “Allison is really tough,” Abrahamson acknowledged. “That was a big point of emphasis the entire game. Second half, as a team, they really stepped up their efforts to get the ball to him. The Hornets got off to a fast start as Hunter hit a 3 and Lambert scored off a steal. The Rockets countered with a 7-0 run but 7-5 was their last lead. Off a steal by Robinson, Canada scored as he was fouled. 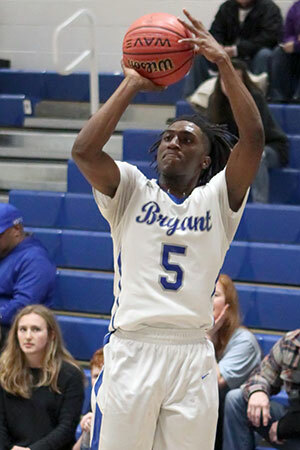 He missed the free throw but Lambert followed up with another theft, leading to a layup by Robinson and a 9-7 lead going into the second quarter. Another 3 by Hunter extended the margin. Baskets inside by Allison and Kameron Wood had the Rockets within 12-11 and when the Hornets committed one of their six turnovers, they had a chance to tie it or take a lead. But Charles Daniel missed a 3-point try and, at the other end, Canada added a free throw. And, once more, Lambert made a steal. Canada drove into the Catholic defense and fired a pass outside to an open Robinson. His 3 made it 16-11. A buzzer beater by Will Kleine made it 16-13 at the half. Canada missed a 3 to start the second half but Robinson made a steal. Lambert was charged for an offensive foul as he attacked the rack but the Hornets forced a second turnover by Catholic. Canada set the tone for the second half by taking a kick-out from Chumley and drained a 3 from the corner to start a Bryant run. The turnovers for the Rockets continued and Robinson nailed a trey. After a timeout and another miscue, Chumley got to the line and, uncharacteristically, missed both shots. Yet another turnover, however, led to a follow shot for the Hornet senior and it was 24-13. Allison scored but Robinson buried another triple. Allison scored again but Canada drove for a bucket. Allison scored once more and, off a feed from Lambert, Hunter knocked down a troika. A turnover by the Rockets led to another 3 for Robinson and a 35-19 lead as Catholic called timeout with 1:52 left in the quarter. When play resumed, Allison scored again and was fouled. But he missed the extra point and Robinson drove from the left wing for a layup. A 3 by Daniel with a minute left in the quarter set the score at 37-24 going into the final eight minutes. Allison’s final basket opened up the scoring in the fourth quarter but Canada answered off the offensive glass. 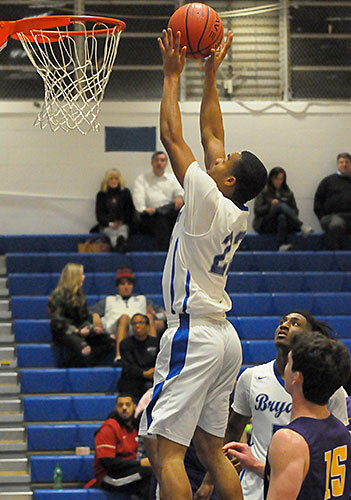 With 4:46 left, Daniel hit a free throw to make it 39-27 then Catholic was unable to score the rest of the game. Robinson and Canada finished up the scoring from there before both teams turned to their reserves in the final minute. Chumley finished things with a pair of steals and layups. 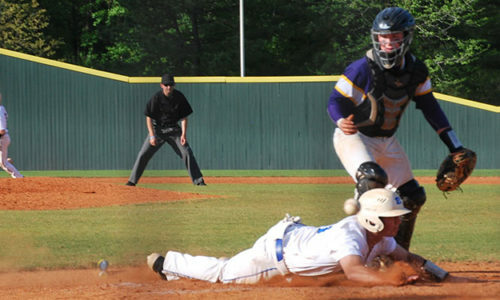 Bryant, now 10-5 overall and 1-1 in the 7A-Central, visits Little Rock Central on Friday. Daniel 1-6 1-5 4, Porter 0-1 2-2 2, Chase 0-1 0-0 0, Dawson 0-2 0-0 0, Allison 6-9 0-1 12, Wood 2-2 0-0 4, Funk 1-4 0-0 3, Edington 0-0 0-0 0, Kleine 1-2 0-0 2, Fitz 0-0 0-0 0, Pruss 0-0 0-0 0, O’Shea 0-0 0-0 0, Lloyd 0-0 0-0 0, Hannah 0-0 0-0 0. Totals 11-27 (41%) 3-8 (38%) 27. Hunter 3-7 0-0 9, Robinson 7-13 0-0 18, Chumley 3-6 0-2 6, Lambert 1-5 0-0 2, Canada 5-8 4-7 15, Wallace 0-0 0-0 0, Hilkert 0-0 0-0 0, Coleman 0-0 0-1 0, West 0-0 0-0 0. Totals 19-39 (49%) 4-10 (40%) 50. 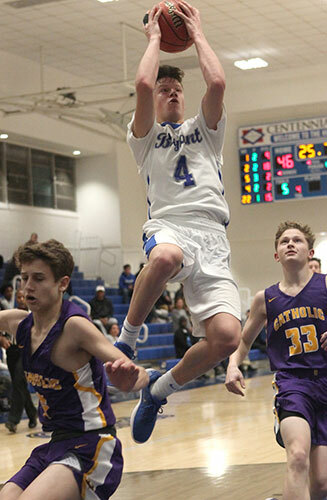 Three-point field goals: Bryant 8-22 (Robinson 4-7, Hunter 3-7, Canada 1-4, Chumley 0-2, Lambert 0-2), LR Catholic 2-13 (Daniel 1-4, Funk 1-4, Dawson 0-2, Chase 0-1, Allison 0-1, Kleine 0-1). Turnovers: Bryant 6, LR Catholic 20. Rebounds: Bryant 7-14 21 (Canada 3-3 6, Chumley 2-2 4, Robinson 1-3 4, Lambert 0-3 3, Wallace 0-2 2, team 1-1 2), LR Catholic 4-19 23 (Allison 3-11 14, Wood 0-3 3, Daniel 1-0 1, Chase 0-1 1, Edington 0-1 1, Kleine 0-1 1, O’Shea 0-1 1, team 0-1 1). Team fouls: Bryant 12, LR Catholic 16.